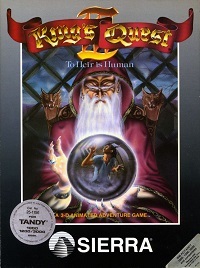 King's Quest III runs perfectly fine in DOSBox. Also, in the DOSBox config, set machine=tandy to get 3 midi channels. If you are not familiar with the use of DOSBox, you can use this automatic installer from the Sierra Help Pages. - "Transforming Another into a Cat": step 6 may incorrectly say, "Mold dough into a cookie". It should be "Shape (or pat) dough into a cookie"
- "Teleportation at Random": the last two verse lines of may incorrectly say, "Take me now from this place thither, To another place far hither." It should be "Take me now from this place hither, To another place far thither." - "Becoming Invisible": step 2 may incorrectly say, "Measure a spoon of cactus juice." It should be "Squeeze cactus juice on spoon."